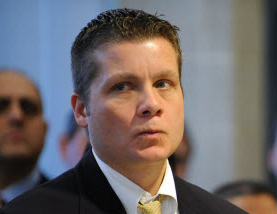 The last Chicago cop facing discipline in the David Koschman case has lost a court appeal to block the Chicago Police Board from acting on a recommendation to suspend him for a year. On Friday, the Illinois Appellate Court reversed Cook County Circuit Judge Anna Helen Demacopoulos’ ruling last year that Sgt. Sam Cirone could have his punishment decided by an independent arbitrator rather than the police board, a panel of mayoral appointees. City Hall appealed, and the appeals court agreed that disciplinary action against Cirone — and any other sergeant facing a recommended punishment at least as harsh as a suspension of more than 30 days — should be decided by the board. The lawsuit filed by the police sergeants union also had blocked the board from acting on Supt. Eddie Johnson’s recommendation to give a 270-day suspension to Sgt. Jack Axium, who was accused of using the “N-word” to refer to then-President Barack Obama in 2015. Dan Herbert, the attorney who filed the lawsuit, didn’t respond to requests for comment. In February 2016, John Escalante, then the interim police superintendent, recommended Cirone serve a year’s unpaid suspension for his role in closing the 2011 investigation of Koschman’s death without charging his attacker, Mayor Richard M. Daley’s nephew Richard J. “R.J.” Vanecko. Days after Escalante’s recommendation, Cirone filed a union grievance, arguing the city waited too long to punish him. City Hall argued the police board has to rule on any suspension of 30 days or more, under the city code and state law. The board also can issue a harsher punishment than what’s recommended. George Roumell, the arbitrator who heard Cirone’s union grievance, ruled against the city. He found that the union contract allows sergeants facing suspensions of 11 days or longer to have their cases decided by an arbitrator. Cirone, a second-generation Chicago cop, was the last of six officers facing punishment over the re-investigation of Koschman’s death. Four left the department. One served his suspension. Cirone supervised the two detectives who re-examined the case. The city’s inspector general found that the detectives failed to do a thorough investigation and that their final report relied on a made-up witness statement to justify closing the case in March 2011 without charging Daley’s nephew. Sun-Times reporting on the case led to the appointment of a special prosecutor and Vanecko going to jail for two months for involuntary manslaughter.